There’s a reason Cheez-Its manage to stand out among America’s many, many cheese-flavored snacks. They are as salty and crisp as you’d want a cracker to be, with a unique tang from the flavoring. What’s more, they actually kind of taste like cheese, which makes them a natural candidate to wash down with some wine — and, as it turns out, white Rioja is exactly what these little cheese crackers demand. Wine from Rioja, in Spain, is easy to find. But most of what you see are red versions. White-wine production in the region is as old as red, but as red wine gained more fame, many of the white vines were uprooted to make way for more red-wine-producing grapes. Today, white wine makes up only about 10 percent of the region’s total output, which is surprising given how special they can be. The main grape is Viura (known as Macabeo in other parts of Spain), and the wines can range from light- to full-bodied, depending whether the style is intended to be enjoyed young or aged a bit. The best versions can live for a decade-plus. And for the purposes of Cheez-Its, the aged version is what you want. The aging is usually done in oak and, depending on how much time the wine spends in it, the level of salty, oily, and mineral-driven characteristics can range quite a bit. 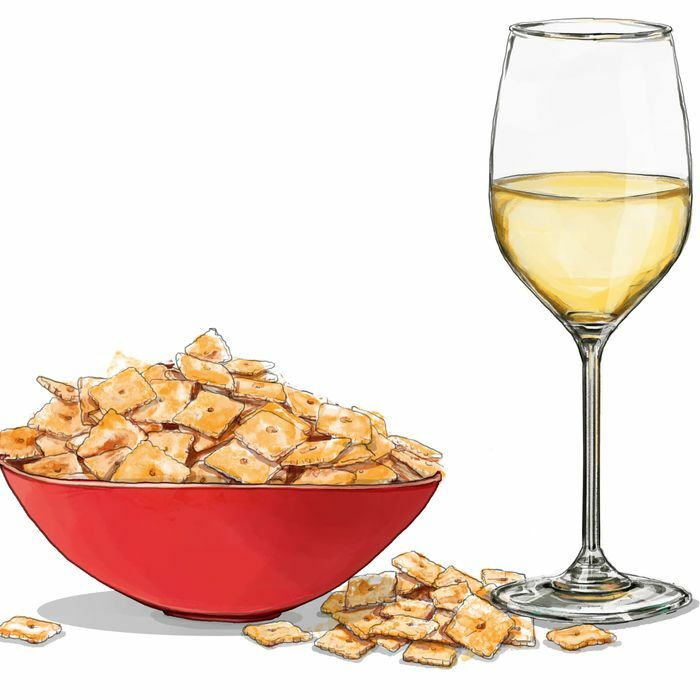 But they’re nevertheless the same notes you’ll get in the Cheez-Its, with the wine’s singed-fruit character exalting the tang of the too-orange crackers. The lift from the acidity also provides lightness to an otherwise intense wine, which plays quite nicely with the cracker’s crunch — and the overall effect can be fairly umami-heavy, meaning you’ll end up having a sip of wine, and a bite of cracker, and then another sip, and then another bite, until the box, or the bottle, or both are empty. Isaac Muga is one of Rioja’s most famous characters and his wines are an extension of his boisterousness. His white balances spicy oak and floral quince flavors. Medium-bodied with a powerful nose showing stone, orchard, and tropical fruit all in harmony. Extended lees aging and used French Oak make this wine brioche-y with ripe orchard fruits and salinity for days from the time spent sur lie (salty silky texture from extended contact with dead yeast). A winery of official cult status. The youngest wines available from this family establishment will still have significantly more age than any of their regional counterparts. They have always stood out as focusing on whites as seriously as red in an area that until recently largely marginalized the category. Balsamic, waxed, honeyed, floral — the list goes on and on and on and on, so get on it.